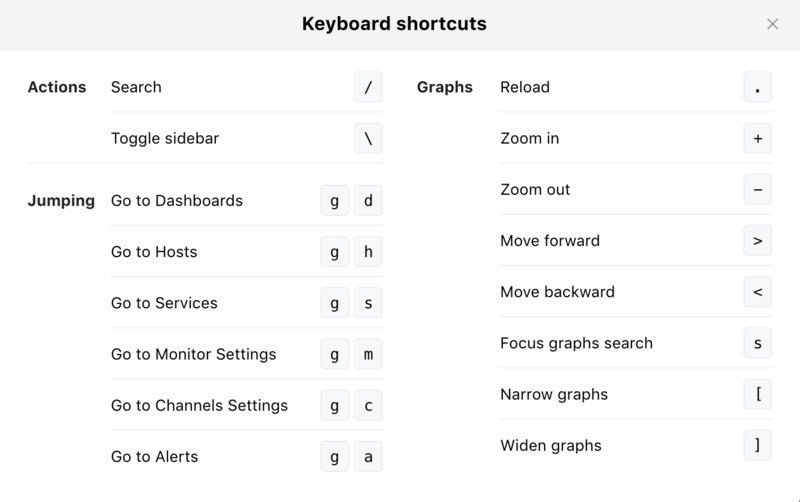 You can now change the number of display graph columns with keyboard shortcuts etc. Anyways, now on to this week’s update information. The ability to change the number of display graph columns has been newly added to Mackerel keyboard shortcut feature. The shortcut cheat-sheet can be viewed by pressing ? from the Mackerel screen. You can increase the number of graph columns (each graph reduces in size) with the [ key, and you can reduce the number of display graph columns (each graph is enlarged) with the ] key. Be sure to try it out. With last week’s release of mackerel-agent v0.54.0, MemAvailable is now available for relatively new Linux users. A separate announcement regarding this was made last week. Please check out the blog entry below for more details. In addition to the MemAvailable support mentioned above, we’ve also made improvements to the process of determining Amazon EC2 instances. It’s now possible to leave an organization etc.